The Ultratex™ base fabric is made of fibreglass, coated with specially formulated dry silicone rubber. Ultratex™ is flame retardant and has a high abrasion and oil resistance, which makes it ideal for use in the oil and gas industries. Harsh environments are no match for Ultratex™, which also has a high resistance to tears and punctures and works well in low temperatures. Ultratex™ is made with a 6" pitch for 15% more wire support and better protective scuff. 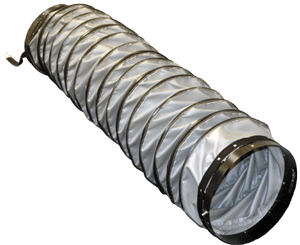 The unique TuffGuard™ scuff strip provides 360º protection for the entire length of the duct, increasing the durability and life of the hose. Wire is encased within the fabric, providing better support, turn radius and air flow. Ultratex™ works in temperatures ranging from -60º F to 500º F.